Based at the Kas Setur Marina, Larsoy Travel & Yachting operates the sensational ‘Tundra’, a 2014 model Beneteau Oceanis 48, a yacht which has established an impressive reputation worldwide for the highest standards in charter yacht sailing. 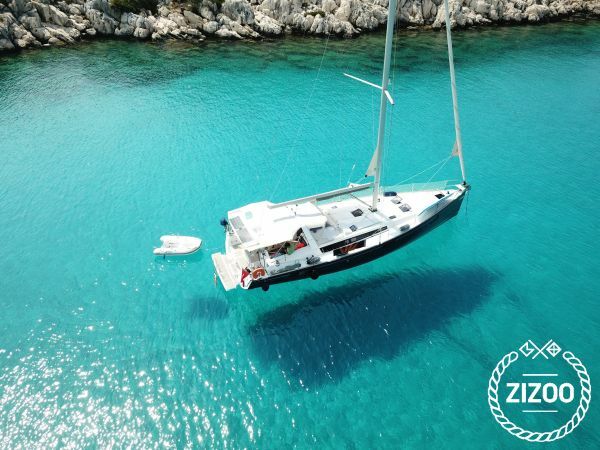 Size of 48 feet, which creates an extremely large and spacious feel below deck, with exceptional sailing performance in luxury and comfort. Ideal charter yacht as she carries her beam well, performs incredibly for a powerful yacht and provides guests and crew with an extremely comfortable ride. Below deck, Tundra, is a paradise at sea, with spacious and well-ventilated interior created from the 11 opening hatches and luxurious but functional appointments throughout. Tundra features one master cabin with its en-suite bathroom and two double cabins which share bathroom facilities. One cabin usually reserved for skipper. Once you experience a sailing holiday in Turkey on the southwest coast – appropriately nicknamed the ‘Turquoise Coast’ – you’ll develop a lifelong passion for this special place. Discover the incomparable beauty of the Mediterranean and Aegean Seas on your Turkey yacht charter as you sail past the country's stunning coast where remains of ancient civilizations testify the country's importance as the meeting point between east and west. This boat is rented with a crew. Usually this includes a skipper to navigate the boat and at least one of a cook or hostess, deck hand etc as the boat requires. Please send a request to confirm the size of the crew and whether the cost is included within the cost of the boat. Requested 44 times this week!